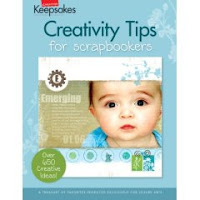 A review of Creativity Tips for Scrapbookers by Tracy White (Editor). Featuring the "best of the best," this 288-page book gathers scrapbooking ideas and tips on creativity, design, and organization from two years of Creating Keepsakes magazines and special issues. Here you'll find tips on everything from how to find more inspiration in the things around you to how to stretch your scrapbooking budget just a bit further. Plus, you'll be inspired by the fabulous scrapbook pages featured in each article. With every turn of the pages, you'll be thinking, "Oh, oh, oh, I want to try that." More than 650 ideas: Effortless tips & tricks; Jumpstart your creativity; Better design for better pages; Take stunning photos; Organization for all your supplies; and Shortcuts for cutting-edge techniques. In my opinion, this book is GREAT!! Yes, it is a compilation of already printed material from their magazine; however, do to room issues, I have never been one to hold onto my magazines for long...six months to a year max. So, being able to get one book that includes all the best from 2 years worth of issues that fits neatly on my bookshelf is fabulous. I did recognize many of features as ones that had been my favorites in the original issues and I loved be able to read and peruse them again. With that said, I know that many people do keep all their magazines...and for a long time at that. If you are one of those people, then, yes, this book probably isn't for you because you would still have all the content. So, keep in mind that my rating is based on my needs and how I scrapbook and manage my supplies and resources.